Answer: An excellent question, RK, and I’m not sure if anything “official” has been decided yet, but the envelope above shows you my best guess. 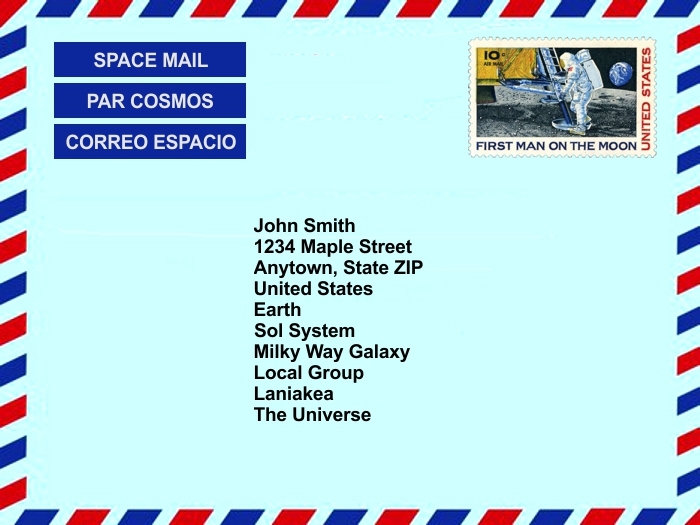 This is how the address would look if the letter were sent to a person on Earth from the farthest reaches of space. I’ll explain all those labels shortly, but first some disclaimers. Although regular written letters will surely be sent and delivered to the Moon and Mars (and maybe a bit farther), delivery times could be as long as weeks or months. More than likely, communications over those great distances would be electronic, like email or texting. Those messages would travel at the speed of light (1.25 seconds to reach the Moon, and up to 21 minutes to Mars). That delay would still allow video calls (like with Skype) to the Moon, but to Mars the delay would make conversations difficult at best. There’d be a 42 minute delay between what you send and what you get back, so conversations would involve a lot of time just sitting and waiting for responses. If you tried that with people living on planets around other stars, that delay would increase to over 8 years — and that’s just for the closest star. At interstellar distances, normal two-way conversations become impractical. That said, you can see how I addressed the example envelope above. This is purely hypothetical, of course, since such a letter could never be sent. And the stamp to send it would cost a lot more than 10¢. But my answer takes your question to the logical extreme. I’m sure you understand the first 5 lines of the address. The other lines will need some explanation. The family of planets (and other objects) that orbit our Sun is called “The Solar System” or the “Sol System.” The latter uses the Latin name for the Sun, and “Sol” is the root word of “solar.” But other stars have names too, so this would be needed to differentiate our system from others. Example: the Alpha Centauri System (which has at least one planet). Research on exoplanets has taught us that virtually all stars have planets. The hierarchy of structures beyond the Sol System (last four lines in the address) is shown in the thumbnails. On the left is one model of the structure of our Milky Way Galaxy. We can’t see it from the outside, obviously, but what we can see from the inside allows us to make a pretty good guess. 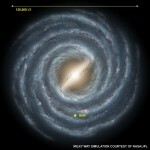 Our Sun is marked by the yellow dot (not to scale) about 26,000 light years (LY) from the galactic center. There’s another 100-400 billion stars, and at least as many planets, in our galaxy. 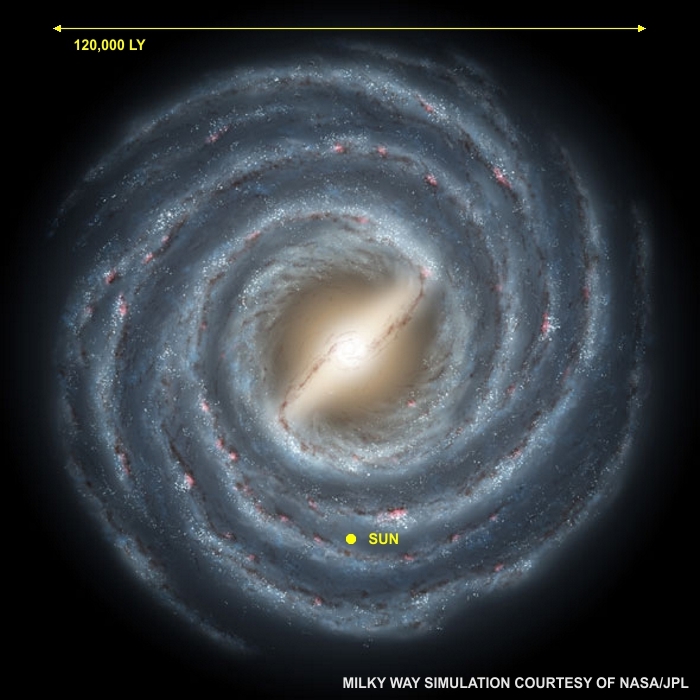 The Milky Way is considered a “medium to large” galaxy compared to others. 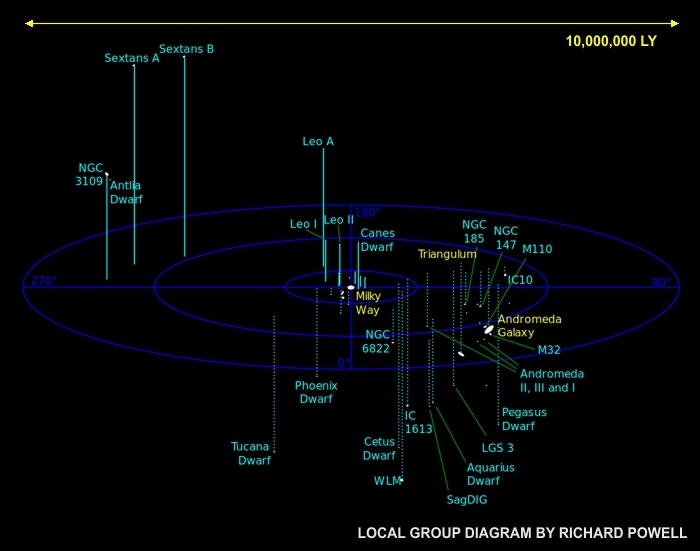 The middle thumbnail shows where the Milky Way is located relative to the Local Group of galaxies. It’s a gravitationally bound assembly of some 54 galaxies, and was given that name by Edwin Hubble in 1936. 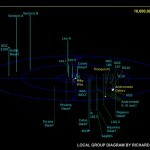 There are billions of such “groups” in the charted Universe. But there is yet another step up in the universal hierarchy. The right thumbnail shows the recently-named Laniakea Supercluster. It’s one of millions of charted superclusters, each containing hundreds to thousands of gravitationally bound galaxy groups. 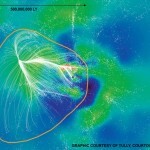 The yellow line marks the boundary between Laniakea and neighboring superclusters. Laniakea contains an estimated 100,000 galaxies. It was named by the scientists who produced this image (see credits). The name “Laniakea” means “immeasurable heaven” in Hawaiian. Astronomers knew we were in a supercluster, since we could see so many other galaxies around us. Previous to the Laniakea discovery, it was named the Virgo Supercluster. But in 2014, the analysis by Tully et al. was used to create a better 3D model of this structure. 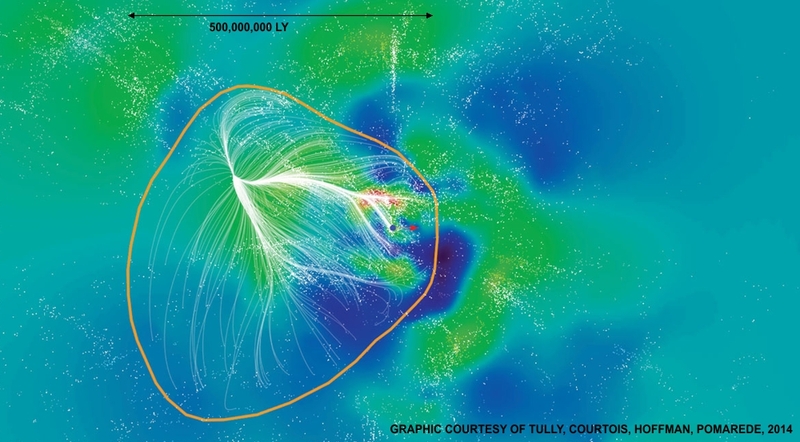 Based on the relative motions of galaxies, their new model shows the Virgo Supercluster is only one lobe of a larger structure, now named Laniakea. The final line of the address would, of course, be “The Universe,” which is the name for “everything that exists.” So the hierarchy necessarily ends there. In fact, you wouldn’t really need that last line. Sure, we could quibble about “visible universe” vs. “parts of the universe so far away that its light hasn’t had time to reach us yet.” And then there’s the multiverse concept, but I think at this point you’ve already learned way more astronomy than you expected. Hey Dan, I was always under the impression that light took 8 minutes to get to us from the Sun. So why so long to Mars? The answer to your question is based on the geometry of orbits. Earth is always almost exactly 93 million miles from the Sun. That’s the radius of its orbit. Divide that by the speed of light (186,000 miles/second) and you get the familiar 8.3 minutes travel time for light (or radio waves) to get from the Sun to Earth. Mars orbits the Sun at an average radius of 142 million miles. Divide that by the speed of light and you get 12.7 minutes. When Mars and Earth are nearest, on the same side of the Sun, travel time for a message would thus be only 12.7 – 8.3 = 4.4 minutes. But when Earth and Mars are on opposite sides of the Sun, the message travel time would be 8.3 + 8.3 + 4.4 = 21 minutes. So that’s why the text reads “up to 21 minutes.” I probably should have explained that in more detail, but I didn’t want to get too far off topic.